I thought it would be fun to share some of my progress sketches to show a bit of my process as an extension of what you can typically see of my finished work on Instagram. Summer is in full swing now and I have been taking more steps to get outside, get over my shyness of drawing in public, and get into drawing on site more than from a reference photo. First thing I have to say about it is this: Urban Sketching is addictive! Its a bit of a rush doing it on site, and actually, shorter pockets of time seem to make me a little more effective. I have been carrying my smaller sketchbook with me (Moleskine A4 – which in plain english is 8 3/4″ by 11 3/4″) and I’m finding the sketch size is starting to adapt to the size of the page. I have an even bigger book (11 3/4″ by 16 1/2″) which I tend to keep closer to home but who knows, maybe one of these days I’ll drag that one out on site to see how big I can comfortably go. The scene. There is a wonderful pathway I walk on my lunch hour some days to get out of the building. It was just put in a few years ago, and it still smells of fresh mulch and the river which is a welcome scent, always. It’s just on the edge of Chinatown and I’ve looked down the street at this angle SO many times thinking how impossible it would be to capture that. But what a view, no? The Chinese Cultural centre right at the end is this great focal point, and the Element on First building just went up in the last year or two as well. I know it’s a little hard to see. The pedestrian walk sign helped me frame in the buildings, and the curb framed in the lower part of the scene. This took me to the end of my time on my lunch break so I stopped here and went back to the office to finish out the workday. I should also note that there was a guy in construction gear napping in the shade about ten feet away from me over his lunch break (I assume!). This would normally have been enough of a deterrent for me in the past to be able to sit down and sketch like no one was watching. I had to remind myself if he can nap there comfortably, I can sketch there too! Adding in darks. This part I struggle with, as I suspect do most of us starting out. I’m really happy with the dark emphasis I ended up putting into the dome tower for the finished piece – but at this stage of the game I couldn’t fully embrace it. Teachers in the past would suggest squinting at the scene to see darks stand out more, but ultimately you have to make the call. Essentially what you are doing with dark stretches is remove minor details to draw attention to bigger features. I find for myself trying to get it to look like something out of an old comic book is a good end point for my first pass with adding in blacks. My favourite Urban Sketcher always says to paint the sky first. This is still a process in learning and experimenting for me as I try to figure out wet in wet washes vs. allowing hard brushstrokes to show. I’ve also really embraced the splatter technique at this point. I love that it contributes to a looseness in the scene. ‘Make messy’ has been my motto of late. Messy is much more preferable to me these days than perfection. I think it looks better and it’s so much more fun to do. To recap, pencil sketching was a 20 minute on site process over my lunch hour on Thursday. Inking with blacks took place at home Thursday evening in two sessions, 20 minutes while dinner was cooking and probably another 30 to finish up between dinner and an evening workout. The first stretch of color above was added in Friday morning. I am extremely lucky to be able to work from home a few times each week. I log into work at seven, and have made it a habit to set the coffee maker for 6AM every day. This way I am out of bed at six regularly, and on telework days I have just shy of an hour to get some creative time in. What a difference it makes in a day – trust me! At seven AM I had to log into work. I left the sketchbook on the floor beside me, open to this page to wink at me throughout the workday. It allowed me to process where to add colour next and to plan out finishing the scene. The end result. This took about an hour after work to bring it from the image above into the finished piece. You can see the added blacks along the left tower – that’s what my eye is drawn to first when I look at this scene. This stuff is SO much fun for me. There absolutely existed a large stretch of life where I would have thought ‘I could never do that’. And now I can. The entire process on this thing was probably between 3 and 3.5 hours start to finish. Finding a solid 3.5 hour stretch in any day is hard. Finding 20 minutes over lunch, and another twenty while boiling rice and broccoli, and then another 40 minutes in which I could have been sleeping but was instead slapping paint on a page is doable. This is what I remind myself. I’ll put the finished piece up in my Etsy shop for purchase and I want to get a print for myself to hang in my cubicle at work. I’m really happy with this one! This entry was posted on Sunday, July 31st, 2016 at 11:49 am. 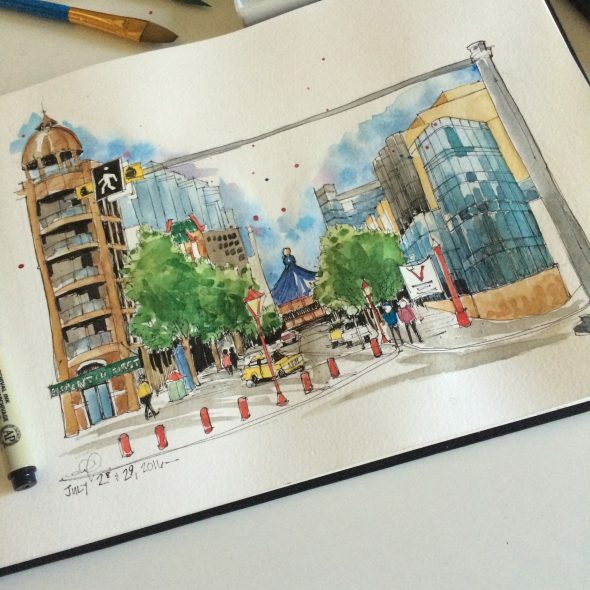 It is filed under General Musings, Home, Sketching YYC. You can follow any responses to this entry through the RSS 2.0 feed.